All men and women are born equal Sovereigns, endowed with Unalienable Rights, Responsibilities, and Credit (commercial energy). A baby is born as the sovereign Holder in Due Course of his/her private Estate – comprising his/her rights, body, soul, creations, real and intellectual properties. Sovereign people living on the land can assemble to constitute a sovereign government “of the people, by the people, for the people” in the Common Law Jurisdiction - the “Law of the Land”. When sovereign people constitute a sovereign government using their “rights already existing” they are delegating some of their inherent powers to their de jure government and its agencies, via their oath-bound Public Servants. 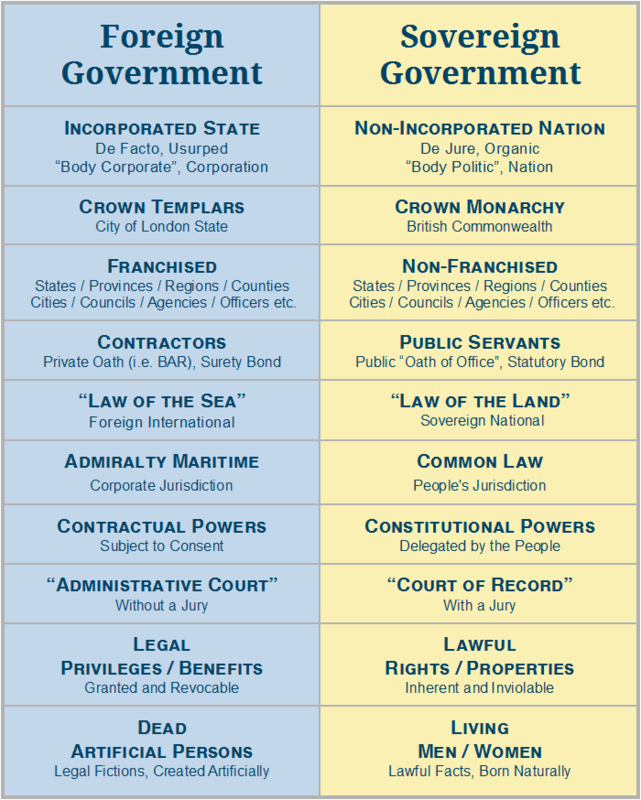 Such a sovereign government is established by a lawful constitution as a “body politic”, whereas a fictional corporation is established by legal incorporation as a “body corporate”. A sovereign government of the people has no jurisdiction over any living man or woman without their fully informed and freely given consent, subject to the “due process of law”. But a government can register artificial legal “persons”, and thereby control its own “creatures of the State” with statutory contracts in the Admiralty Maritime Jurisdiction - the “Law of the Sea”. A man or woman who contracts with the State, freely or unwittingly, consents to “act” in a “public capacity” as an artificial legal “person” which is controlled by the issuing authority, the State. While such a government grants Privileges to artificial legal “persons”, it cannot grant any Privileges that living men and women do not already have as Unalienable Rights. Your Unalienable Rights are only limited by your Common Law responsibility not to harm other living people, and by your Common Sense responsibility toward the living Earth, whose Natural Laws govern all Life. Sovereignty resides in the People, whose Power is the source of Law. “Sovereignty itself is, of course, not subject to law, for it is the author and source of law; but in our system, while sovereign powers are delegated to the agencies of government, sovereignty itself remains with the people, by whom and for whom all government exists and acts. And the law is the definition and limitation of power.” Woo Lee vs. Hopkins, 118 U.S. 356 1. “People are supreme, not the State.” Waring vs. the Mayor of Savannah, 60 Georgia at 93. “The people of the State do not yield their sovereignty to the agencies which serve them. The people, in delegating authority, do not give their public servants the right to decide what is good for the people to know and what is not good for them to know. The people insist on remaining informed so that they may retain control over the instruments they have created.” Added Stats. 1953, c. 1588, p.3270, sec. 1. “The people are the recognized source of all authority, state or municipal, and to this authority it must come at last, whether immediately or by circuitous route.” Barnes v. District of Columbia, 91 U.S. 540, 545 [23: 440, 441]. p 234. “the government is but an agency to the State,” -- the State being the sovereign people.” State vs. Chase, 175 Minn, 259, 220 N.W. 951, 953. "The rights of the individual are not derived from governmental agencies, either municipal, state, or federal, or even from the Constitution. They exist inherently in every man, by endowment of the Creator, and are merely reaffirmed in the Constitution, and restricted only to the extent that they have been voluntarily surrendered by the citizenship to the agencies of government. The people's rights are not derived from the government, but the government's authority comes from the people. The Constitution but states again these rights already existing, and when legislative encroachment by the nation, state, or municipality invade these original and permanent rights, it is the duty of the courts to so declare, and to afford the necessary relief.” City of Dallas, et al. vs. Mitchell, 245 S. W. 944, 945-46 (1922). “A constitution is designated as a supreme enactment, a fundamental act of legislation by the people of the State. A constitution is legislation direct from the people acting in their sovereign capacity, while a statute is legislation from their representatives, subject to limitations prescribed by the superior authority.” Ellingham v. Dye, 178 Ind. 336; NE 1; 231 U.S. 250; 58 L. Ed. 206; 34 S. Ct. 92; Sage vs. New York, 154 NY 61; 47 NE 1096. “It is not the function of our Government to keep the citizen from falling into error, it is the function of the citizen to keep the Government from falling into error.” American Communications Association vs. Douds, 339 U.S. 382, 442, (1950). Any incorporated government in the international “Law of the Sea” is a foreign government. A sovereign government cannot also be a corporation, because sovereignty is the source of law, and a corporation is a creation of law. While sovereign people, as the source of law, can create various legal fictions including artificial persons, corporations, companies, trusts, societies, foundations, and so on, a sovereign government and its sovereign agencies are by definition unincorporated. But all Central Bank nations are incorporated, such that the de jure nations of the world are largely unoccupied by oath-keeping representatives of the sovereign people. De jure Common Law Jurisdiction “Law of the Land” governments have been usurped by de facto Admiralty Maritime Jurisdiction “Law of the Sea” interlopers, who are essentially private mercenaries administering fraudulent bankruptcies. Any incorporated government operating in the international “Law of the Sea” is foreign to the “Law of the Land”, and therefore it is a foreign government. Every sovereign man and woman oppressed by an incorporated government is a victim of treason.